Welcome to the Carvoeiro Property website, the insider guide for those who love Praia do Carvoeiro and have chosen this beautiful corner of the Algarve for their holiday home or to live full time. 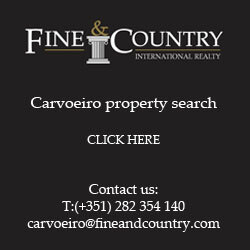 This website is brought to you by Fine & Country Carvoeiro, part of the multi award-winning Fine & Country network with offices in 275 locations around the world, operated here in Carvoeiro by Fino Propriedades Lda. Our office is located on Rua do Barranco the "out road" near Caixa Geral Bank so please call in to meet the team and discuss your property requirements. As well as offering a brokerage service for the sale of high quality villas in Carvoeiro and elsewhere in the Algarve, along with townhouses apartments and plots of land, we provide a professional property management and maintenance service.